We've tweaked the design to keep it looking fresh on iOS8 and the app is now optimized for iPhone 6 and iPhone 6+ screen sizes. Don't just quit for a month... Stop Smoking For Life in just 2 hours! STOP SMOKING IN 2 HOURS requires NO WILLPOWER...NO GUMS OR PATCHES...NO GIMMICKS... Just a Simple Way to Freedom. Addiction and health author Jason Vale ran a "Stop Smoking" clinic for 9 years and successfully helped thousands of people to become smoke-free. Jason used to smoke 40-60 cigarettes a day himself, until he learnt the secret to stopping in 1995, and hasn’t smoked since! Now, YOU can learn Jason’s secret from his tried and tested programme from the convenience of your own iPhone / iPod / iPad. Jason is literally in your pocket every step of the way! 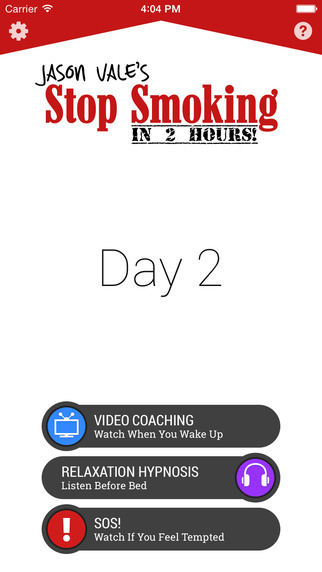 * Daily motivational coaching videos to keep you on track during the "5 day adjustment period"
"Jason’s Vales Stop Smoking in 2 Hours is a bit of a revolutionary self-help app for the iPhone. 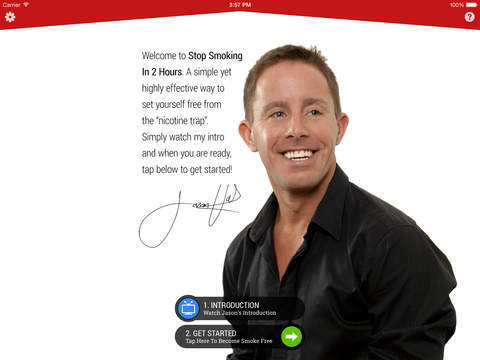 Now we have seen some really good “quit smoking” apps over the years, and the better ones utilize an element of hypnosis, but Jason Vale goes above and beyond, utilizing audio hypnosis and video coaching to help finally get smokers to kick the habit with advice so simple and practical that it almost doesn’t make sense at first listen! Jason uses that calming yet forceful British accent to constantly remind us that the pleasure or the crutch is an illusion and we will gain nothing from the smoke. The app features a video to watch upon waking, audio hypnosis for relaxing at bed time, and my personal favorite; Jason’s video titled SOS. Jason is right there on the screen, talking you off the proverbial smoking ledge when you really crave a cigarette. I found this inspiring and very practical. The videos really make this app, and add a nice, personal flair."